Just from the title alone, I knew that Kathy Fesmire's recent book - Time to Scrap: Techniques for Fast, Fun and Fabulous Scrapbook Layouts - would be a good fit for my needs. Then, I identified an immediate bond with her when, in her introduction, she described scrapbooking as her 'creative outlet', but that family and work responsibilities didn't allow her as much time to scrap as she would like. This book offers ideas for putting layouts together quickly, but with techniques and designs that you can still totally be proud of AND, in many cases, don't look quick at all! The book is divided into 4 main chapters. This chapter includes many great ideas for page creation in as little as 15-90 minutes. There are 9 featured techniques, each with 2-3 variations to keep your layouts looking fresh and original. This chapter is full of interesting new techniques or unique twists on not-so-new ones. There are 8 featured techniques, each with 2-4 variations. Just as I don't have the time to match my desire to scrap, I also don't have the budget to match either. I'm sure I'm not the only one with this issue and Kathy offer several techniques in this chapter to help us stretch our stash. There are 9 featured techniqes, each with 2-8 variations. Here, Kathy focuses on how to use the principles of good design to make every page fabulous. There are 9 featured designs, each with 2-6 variations AND an accompanying sketch to highlight the fundimental elements of the design. There are a few other fun features of this book. For example, there are 29 pictoral step-by-steps in the book that help the reader achieve the techniques featured int he book. All are achieved in 2-6 detailed steps. All layouts include a clock icon that indicates the time necessary to recreate the look of the sample layout. Scattered throughout the book are 'Make it Fast' (7), 'Make it Fabulous' (16), and 'Make it Frugal' (7) boxes that offer further useful and creative tips for making stunning layouts. There are a total of 120 sample layouts included in this book. The talented contributing artists include the author herself as well as Jennifer Gallacher, Julie Johnson, Shannon Taylor and Shaute Wadley. 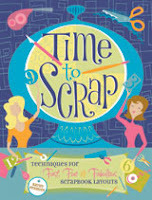 Even if you're short one scrapping time - perhaps especially - it's worth your time to take a gander at Time to Scrap by Kathy Fesmire.